Ishak Pasha Palace is part of the Tentative list of Turkey in order to qualify for inclusion in the World Heritage List. Ishak Pasha Palace is in Eastern Turkey, close to the Irananian border. It stands strategically on a platform above the Sariova plain, surrounded by some of Turkish’s highest peaks, including Mount Ararat. It controls a strategic stretch of the Silk Road, a few kilometers above the town of Dogubayazit. I visited this palace in october 2018 while driving from Van to Kars (on the way to visit Ani WHS). Dogubayazit is about half-way. Roads are in very good condition. There are numerous police checks, as it is close to the Iranian border, but nothing to worry about. The palace is quite recent, having been built by local pashas in the 18th century. It served as a palace but also as an administrative center. It mixes Anatolian, Iranian and North Mesopotamian architectural tradition. It was badly damaged by successive wars and an earthquake. Most of the roofs have collapsed and have been replaced by a glass footop. Entrance is through a very nicely decorated portal with Seldjuk features and costs 6 lira. There are two courtyards, the second one the nicest with views on the mosque’s dome and the mausoleums in which the pashas rest. The harem section is well preserved with spectacularly decorated rooms and remains of central heating control. The view on the plain below with the town is spectacular. Mount Ararat is hidden behind hills however, but is seem again as soon as going back down. 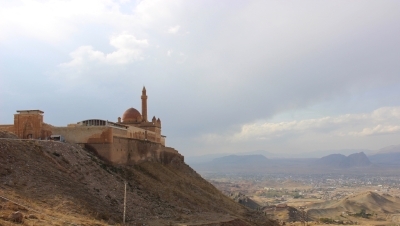 Ishak Pasha Palace is a nice site, with spectacular views around the rugged mountainous landscape of Eastern Turkey. It is worth a stop if travelling in the area.